You hear the ads on the radio, and see the billboards with smiling truck drivers with their hands on their hips or giving a thumbs-up, looking like, well, recruiting posters. They look really happy and satisfied. But what is the life of a truck driver really like? I've been a professional Schneider driver for nearly three years now, and can tell you it's been fun, interesting, frustrating, satisfying and challenging — often all on the same day. It's a cliché, but it really is true that for an over-the-road driver, one who spends a few days or weeks on the road before returning home, each day is different. One day I may be challenged by heavy traffic in a city, and yet, only a few hours later, I'm enjoying a nice drive along a state highway along the Mississippi in Minnesota, seeing an eagle soar across my path. So what's a typical day like for me? Early start: I usually wake up before 0600, in a warm truck with my own favorite bedding and pillow I've brought from home. Breakfast: I can decide what I want to eat and drink after a full 10-hour break because I brought it with me as part of my plan to eat healthy. Shower: Perhaps I'll take a shower before I go, or decide to take one a bit later in the day when I stop at one of our operating centers or a truck stop when I get fuel and take a break. Hitting the road: With everything ship-shape, I'm headed down the road. Maybe I have a day or two of driving in front of me before delivery, or this may be the day to deliver my trailer to a distribution warehouse. Live unload: I may wait while they unload it at a receiving dock. In either case, my in-cab company computer (new tablet coming soon!) details when and where I'm to get my next load, and it will also help me plan my trip. In the middle of my day, I'll take a 30-minute break. In the interest of safety, it is mandated by the Department of Transportation. It’s important to get out of the truck, take a walk and stretch, and enjoy a light lunch or snack to keep me fresh and ready for the second part of my driving day. If I know where my day will end, I'll have planned for the place I plan on spending the night. Sometimes it’s one of the many truck stops along my route, or a safe, well-lit rest area. I often stop overnight at rest areas I've come to know across the USA that are well maintained. In addition to well-equipped modern truck stops, some states go out of their way to provide amenities like showers and laundry facilities. In particular, the Ohio turnpike (I-80) has a series of rest areas that are second to none when it comes to those facilities, along with food choices and plenty of parking. Finding parking: I do my best to be parked no later than 7 p.m., and since I usually start my day pretty early, being done earlier than 7 is fairly common. Post-trip inspection: Once parked, I'll do my post-trip inspection of the tractor and trailer to make sure the equipment is still in good shape after a day on the road. Paperwork and Workflow: After the inspection, I’ll finish off any remaining paperwork or Schneider Workflow load-related tasks on the in-cab computer. Dinner: Then I'll be ready to cook something for dinner. By carrying my own food in an electronic cooler, or ready to be cooked on board in a microwave (if your truck is equipped with one) or one of the 12-volt cookers available to heat up dinner, you can keep your costs down. Then when the opportunity presents itself, it's nice to make up a meal you can enjoy at a pleasant rest area. Every driver has to discover his or her own way to manage meals on the road. A little innovation can go a long way to prevent yourself from eating out every meal. Free time: I may spend the rest of my evening reading or working on my computer. For internet access, I have a data plan on my cell phone which turns it into am internet hot spot, allowing me secure access wherever I have a cell signal. With the bunk heater on to keep the cab warm during the late fall night, I'll get a good night's rest before getting up bright and early to get started on my next journey. Much of what makes the life of a truck driver successful is in the planning and preparation that goes into each journey. My mileage per day averages 350-450 miles, with a day every so often over 500 miles. That translates to 7 1/2 to nine hours of driving each day. Other drivers who have different schedules are able to drive more miles in a given day. Ultimately, every driver looks for something different. Miles aren’t as important to me as others, as I tend to average fewer miles per month as a training engineer, since I give my students a bit of extra time to get things like backing done. If you’re looking for ways to maximize your miles, you can do that, too! While the interstate system is where I usually find myself tooling along to efficiently deliver my cargo, there's enough city, town and state highway driving to keep my skills sharp and my attention focused. Make no mistake, even as I enjoy the sights, my responsibility is to my fellow motorists to drive my truck in a safe manner and be a patient professional truck driver. Thankfully, there are often opportunities to stop and enjoy a local view or perhaps a restaurant that features something you haven’t had a chance to try (I had some great catfish in Louisiana). The life of a truck driver is ultimately what you make it, and I’ve found it to be a rewarding career packed with new challenges and opportunities every day! Looking to see for yourself what the life of a truck driver is like? Explore all our driving opportunities near you and get started today. Comment below with any questions about what the life of a truck driver is like. Henry "H.G." 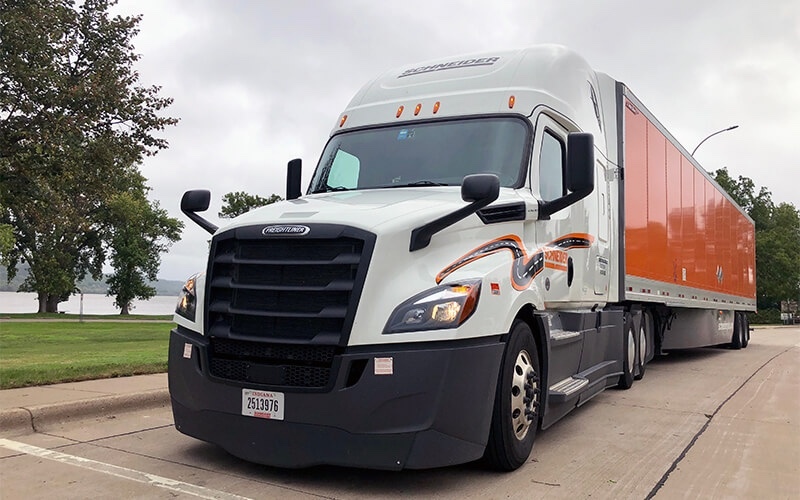 Frautschy of Oshkosh, Wis., is completing his first year as a Schneider driver. Previously he served as the editor of EAA's Vintage Airplane magazine, and the Executive Director of the Vintage Aircraft Association. A longtime private pilot and FAA-rated mechanic, he enjoys writing about ground and air-based transportation issues. What is Life Like as a Schneider Over-the-Road Truck Driver?